From gyms to office buildings, restaurants to music festivals, and anywhere anything is being sold, you can bet that bottled water is on the menu. It’s become so much a part of our everyday lives that we don’t even notice it anymore. If you were to look under the seat of your car, you’d very likely find an abandoned plastic bottle filled with stagnant, warm H2O. Bottled water is consumed more by Americans than either milk or beer, and unlike the aforementioned beverages, the packaging is less likely to be recycled. All of those bottles add up to an infinite and landfill-clogging list of reasons to kick the habit. 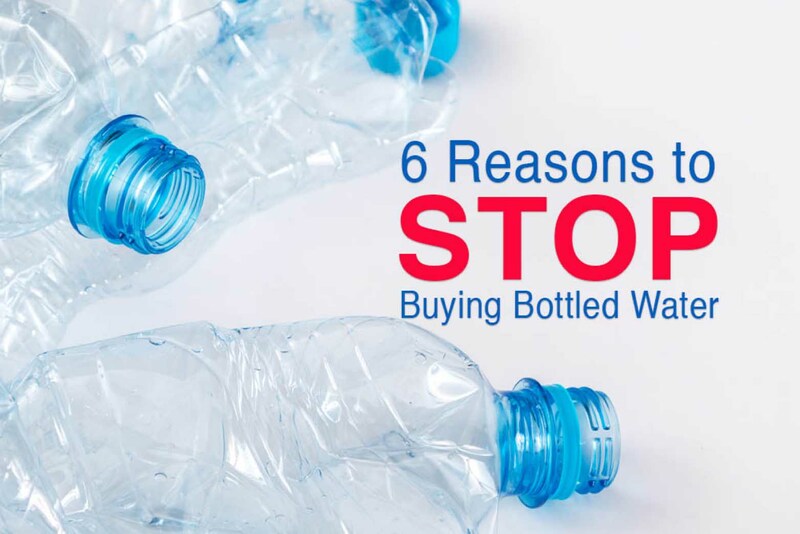 Today, we’ll talk about 6 common conceptions about bottled water, and shed some light on the dark side of bottled water. It’s so convenient to grab a bottle of clean, cold water from your local gas station, check out counter, or vending machine. The cost is a bit of a bite, but in a moment, it seems worth the little extravagance. That’s right, the cost classifies it as a luxury item. Depending on where you’re purchasing it from, that bottle could run you between about a dollar and upwards of $4. Many events take advantage of your relative helplessness and the fact that you’re not allowed to bring in outside food or beverages to gouge you for up to $7 (at theaters and music festivals, for instance) but that’s a pretty extreme example. Instead, let’s take a look at averages. A study published in Business Insider illustrated that bottled water is up to 2000 times more expensive than tap. Gripping the $4 bottle you purchased at the movie counter you try to ration your 20 ounces through your feature. The previews haven’t started yet, so you gaze at the bottle’s packaging. There’s a mountain. Maybe a spring. Possibly snow. Before you disappear into the land of make-believe, let us hit you with just a little reality. That’s just tap water. Really expensive tap water. Some brands filter the water again in the factory, as the process of moving it can may expose it to contaminants, but often what you’re getting is nothing more than municipal water. The fine print on the side of the bottle will even tell you where. A marketing department decided what language would have you believing that water was tapped straight from the side of a pristine mountain and transported by silent monks to prevent damaging the energy of the water. In reality, that’s not where it was “tapped” from at all. That marketing department was really expensive, and they couldn’t afford the silent monks for transport. That leaves your water vulnerable to non-silent human error. It’s uncommon, but more than 100 bottled water recalls have taken place in recent history due to algae, chlorine, and bacteria being bottled in with your tap water. For an enlightening, if somewhat grim read, check out this CBS article about some of the contaminants discovered in your “purified, triple filtered, pure mountain spring” water. If you’re wondering what the FDA has done to ensure that your very expensive tap water is safe, the answer might be: Not much. Regulations for national bottlers don’t apply when the water is bottled and sold within the same state. After a huge push, millions spent on marketing the benefits of recycling, a national holiday devoted to protecting the planet, and recycling becoming a popular political platform, there was an increase in recycling in 2015. A ONE PERCENT increase. According to The Association of Plastic Recyclers, only about a third of the 50billion water bottles purchased by Americans annually find their way to recycling centers. The environmental impact of a single bottle of water may end with an eternity in a landfill, but its footprint begins at its conception. From the factories employed to create and fill the bottles, to the energy required to deliver to stores and vendors, it’s estimated to cost more than 2,000 times the energy of tap water. Which is ironic, since that’s what’s in the bottles. Additionally, even if the bottle in your hand is one of the <1/3 that will end up in a recycling center, the energy used to transport and recycle the bottle keeps your hands from ever truly being clean. Increasing your water intake is the first, and arguably the most important step in reaching many of your health goals! Better skin, higher energy, appetite control, fat loss, improved organ function, drink more water! And many “BPA FREE” bottles and products have replaced the known carcinogen for phthalates, which also have the potential to leach from the plastic into the water. Phthalates have bene proven to disrupt the endocrine system, which means they can play havoc on your hormones. If you’ve ever left a bottle of water in the car on a warm day, or if the packaging was exposed to sun or heat during transport, your bottle is more likely to be contaminated, as warmth and light break down the chemicals in disposable bottles. Anyone who drinks a lot of water can tell you that not all water tastes the same. Many people even have a favorite brand of bottled water. While the difference in tap taste does differ from one municipality to another, the idea that bottled water tastes “better” than tap is purely marketing and placebo effect. A google search will reveal dozens of blind taste tests proving that most people cannot tell the difference between bottled and tap water. Unless you’ve moved to a new region and purchase water that was bottled in the region whose water you’re more accustomed to, it’s unlikely that you yourself can truly tell the difference. It’s easy enough to say “just drink tap water”, but there is a reason that simple solution hasn’t caught on in your home. Whether it’s taste or worries about contamination, you aren’t utilizing your already-paid-for water supply, and you’re not alone. According to the 2015 Water Quality Association report, 77% of survey respondents use bottled water. 41% cited flavor as their top concern, and another 37% were worried about contaminants in their supply. Bottled water marketing tactics work hard to capitalize on these concerns and offer what seems like an easy solution. As we’ve covered, bottled water isn’t actually a sustainable solution, and in most cases, isn’t even a better option. If water quality is a concern for your home, or if there is a potential contamination in your area, Clean Water Testing services can help you identify any safety issues you may be facing. If it’s taste, smell, or mineralization that’s turning you off your water, there are reverse osmosis and softening options available to help you better utilize the utilities you’re already paying for! Puchasing a BPA and Phthalate-free reusable bottle will make your hydrating habit even healthier, and you can rest easy knowing your water is filtered in-home, algae free, and without the high cost of the Rocky Mountain Marketing firm! Refills are now available at our water store, 24 hour vending station or grocery/health-food locations, refills from .25 to 39 cents per gallon http://omahawater.com/locations/ and in-home solutions, rental systems for as low as $22.95 per month. http://omahawater.com/drinkingwater/.